In West Palm Beach, 18.7 percent of the population lives below the poverty line, compared with 14 percent for Palm Beach county and 14.5 percent for the U.S. as a whole. The city is also home to a large proportion of the county’s 27 federally designated food deserts. Residents live in a stark contrast to the area’s natural abundance of fresh produce, with limited retail and transportation options to grocery stores. 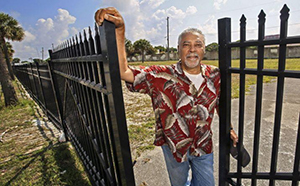 One man, Stewart W. Bosley Jr., and his non-profit organization Urban Growers, has broken ground on West Palm Beach’s first urban farm, and they’re set to harvest their first crop in January. Around the same time Bosley moved to West Palm Beach, the city was starting an office of sustainability. In one of the first sustainability working group meetings, Bosley connected with the city’s Extension Director, Audrey Norman, who helped to connect him to the the resources he needed to get started on the farm. After a long process of land acquisition and jumping hurdles, the Urban Growers’ Community Farm, also known as the Henrietta Bridge Farm, is finally growing produce. Bosley hopes that this farm will produce fresh and chemical-free vegetables and eventually fruit for the residents who otherwise would not have access to these healthy foods. Because of the climate in Florida, the farm will be operational from September through May every year, growing and harvesting produce for an on-site farm stand and eventually a CSA for community residents. In addition to producing fresh and local produce for the community, Urban Growers is also providing job training and job opportunities to residents of the neighborhood, including previously incarcerated and at-risk youth. The plots were installed by previously incarcerated individuals from the juvenile justice system in Palm Beach county as part of a restorative justice program in West Palm Beach. Urban Growers hopes to continue supporting this population and other individuals from the community as they begin to harvest their first crop and expand their business.